Sleep is essential to your overall well-being and is strongly linked to academic success. 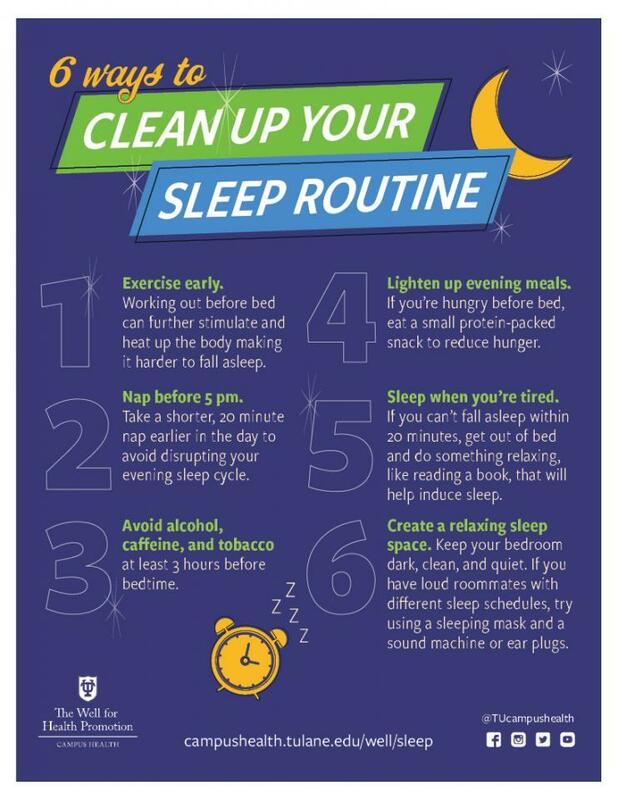 Prioritizing sleep when there is a lot going on can be difficult, but taking steps to plan for a good night's rest will help you thrive at Tulane. Exercise for at least 30 minutes during your day, but not 2-3 hours before bedtime. Avoid caffeine, alcohol, nicotine, and large meals a few hours before bed. Make an effort to create a sleeping environment without loud noises, bright lights, or technology. Cozy eye shades and earplugs can be helpful! Take breaks throughout the day to improve focus, energy, sleep, and overall well-being. For information about mindfulness offerings on campus, visit mindfulness.tulane.edu. Set a calm alarm at night to prompt your transition to bedtime so you get 8 hours of sleep. Try not to hit SNOOZE. Experts say that those extra 10 minutes will only leave you groggier. Try taking a 20-30 minute mid-day nap for improved alertness and performance without leaving you feeling groggy or interfering with nighttime sleep. If you are having trouble falling asleep because of worries or thoughts, spend a few minutes writing them down in a bedside journal. If 15-20 minutes have passed and you are unable to fall asleep, try some gentle yoga or reading. Consult a professional if sleep difficulties persist. There are programs and services on campus that can offer support. Contact CAPS or The Health Center for a consultation. Our on-campus Nap Map represents the best napping spots on campus, as voted on by Tulane students! Use this map to locate your optimal napping spot. Click on each location for more detail. Safety Tip: If you are napping somewhere other than your room, use your backpack as a pillow and make sure nothing valuable is sitting out. Remember to use caution when picking a nap spot and always keep your belongings with you. Share this on your favorite social media.